Mali Mish - Day 142: Meeting new friend from Naples. Day 142: Meeting new friend from Naples. Not only is Luka now crawling, he is also pulling himself up on a regular basis. When the girls wake up in the morning, he loves to stand up on their bed and look out the window at our neighbors to see if there is anyone new. The problem with him being so mobile is that we can’t feel comfortable leaving him sleeping on the bed alone anymore. For the last couple of months, we have been piling up blankets and pillows to act as a barrier so he doesn’t accidentally fall off during naps. Well that technique no longer works. Now he can just wiggle his way right over the pillows and potentially plop himself right on the edge and fall to the floor. 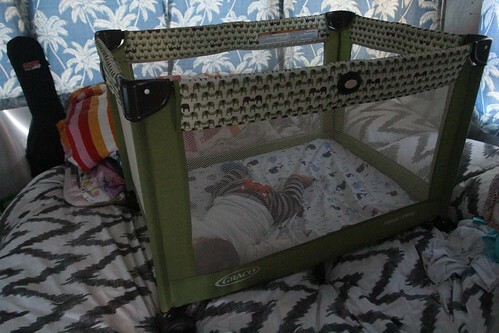 We have been carrying around this pack-n-play for that very reason. It is now time to put it to good use. During our last trip Mila slept in a pack-n-play pretty much every night. She used it so much, it broke while we were in New Orleans and we had to buy this one while we were there to replace it. Now Luka is helping get our money’s worth on the purchase. Yesterday, we had a high and low pressure system converge around here and the winds turned from onshore to offshore. 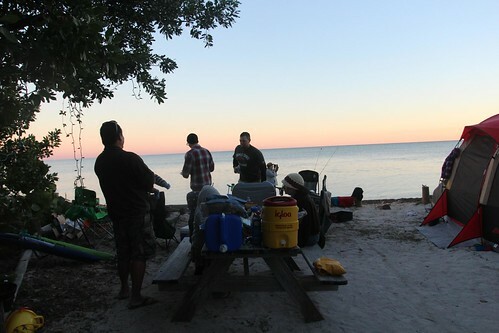 It mostly affected the gulf side of the keys but just to be safe, we staked the legs of the Easy-Up into the sand and lowered it overnight just so it doesn’t blow away. 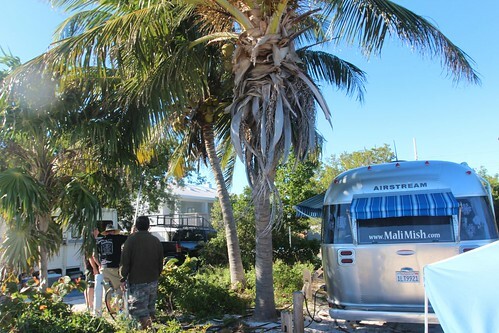 Our guest post at the Tiny House Blog attracted a lot of new readers to our blog in these last couple of weeks. One couple in particular, who found us through that post, became our friends on Instagram. 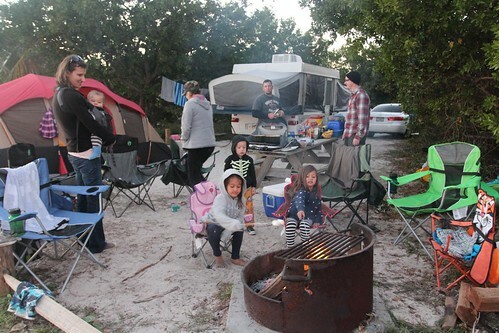 It just so happens that they are coming down to Long Key from their home in Naples for the weekend and we are going to visit them at their campsite today. 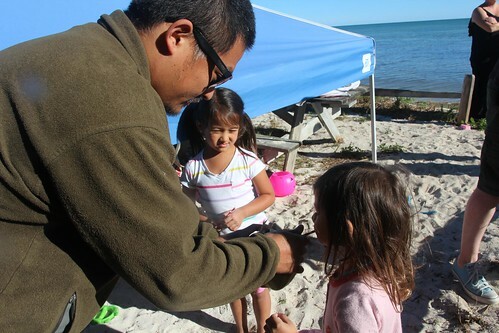 They are 12 sites down from us and since all of them are along the water, we just had to walk down the beach. You can find all kinds of wildlife both alive and deceased during these walks. 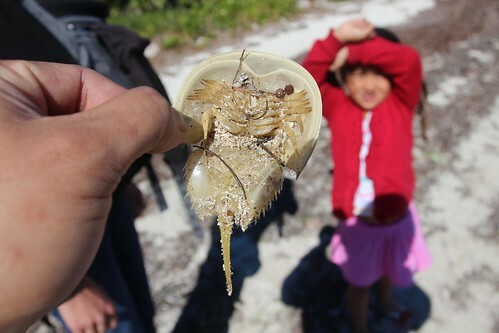 Here is a horseshoe crab that Ava was really scared of. We met our new friends from Naples who go by @ParadiseTech and @BrandNewDay7 on Instagram. In one of their posts, they were at the Naples Trader Joe’s. We commented about how much we are looking forward to going there to stock up on supplies and they graciously offered to bring us a little treat. 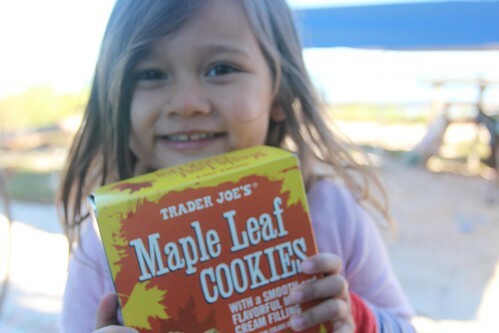 These maple leaf cookies are extremely addictive. It is even more so for Marlene because they are dairy free and is one of the few cookies that she can eat right now. As we were chatting, they told us about the coc frios roadside vendors sell in Florida. It is basically just a chilled coconut with a straw in it. I told them that the tree next to us was chock full of bowling ball size coconuts so we all made our way down for a little harvesting. 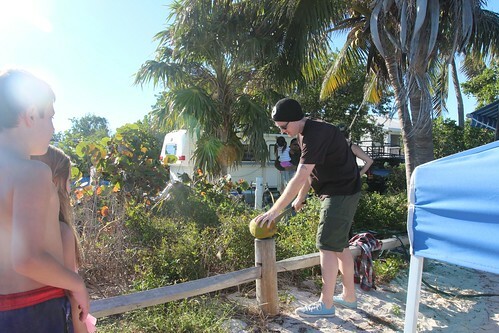 We jury-rigged a long pole with a loop to pull down these coconuts while Brian, AKA ParadiseTech, took on the job of cracking them open. Now we are really living the island life. Harvesting our own coconuts for survival and nourishment. All we need now is a Wilson volleyball. Brian and his wife Beth have 2 boys that are pretty much the same age as our girls. They also have some friends of theirs, Brandon and Meghan, who also came down with them with their two kids. We hung out at their site for the afternoon and they graciously made dinner for everyone. This is the absolutely best part about being on the road. It’s not the beautiful scenery, although it is definitely a nice perk, it is the opportunity to meet great people from all over the country who are like-minded, appreciate our way of life and don’t take each day for granted. Life is good. Day 141: Lunch in Marathon and a visit to Curry Hammock. Day 143: Last minute Christmas shopping. 3 Responses to Day 142: Meeting new friend from Naples. I was wondering when u have had your children did u return to the same hospital/doctor and did u stay in the same place for the duration of the pregnancy? Looking forward to following your travels! It sure would be awesome to meet up ‘on the road’ someday. @julia: Hi. We did not travel during our pregnancies or deliveries. We hit the road when Mila was 5 months old back in 2010. 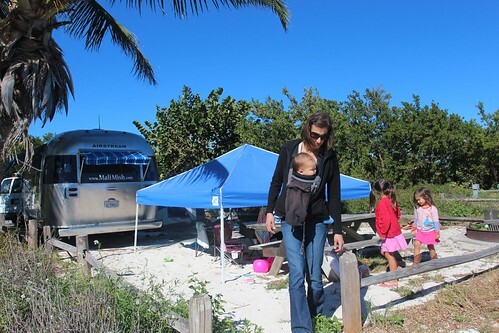 And this year we hit the road when Luka was 3 months old. I do take them to public health centers around the country for vaccinations. @beth: I sure do hope we run into each other on the road someday. 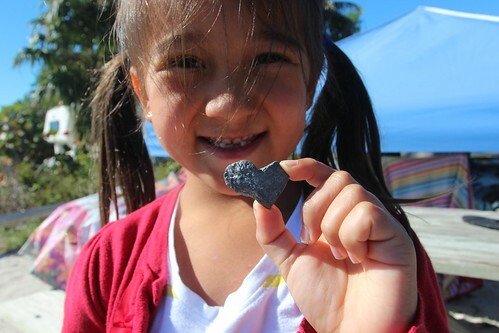 The travel thing CAN be done… and the kids love it.